Brasserie-style French restaurant in a converted pub in Kennington. It was opened in November 2008 by two brothers, Nolan (maitre d') and Florent (chef), whose parents ran the (now-closed) Lobster Pot fish restaurant next door. 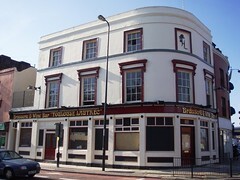 The brasserie part is on the ground floor, and there's also a wine bar upstairs, with a small smoking terrace attached. Other options are a small bookable private dining room and a "chef's table" for two inside the kitchen. Upstairs in the bar area photo, half-round brown leather chairs cluster around small round marble-topped tables, with a bar to one side and a tiny stage (complete with baby grand piano) at the end of the room. The three stools at the bar are pleasingly large-seated. Exposed brickwork and ceiling beams contribute to a definite "upstairs room" vibe. There's probably seating for around 40 people, though the room really isn't that big at all. As of June 2009, the Toulouse Lautrec website advertises live piano jazz up here every night from 8pm. The ambience is a little more formal in the ground-floor restaurant area, with tables laid with cutlery and wine glasses, though the white linen tablecloths are inexplicably covered with not-particularly-nice thick plasticky overcloths. Kake and two friends visited for an early dinner on a Thursday evening in June 2009. We hadn't booked, but on arrival at 6:30pm we were the only people in, so this wasn't a problem. The menu photo is short, and offered at a fixed price of £5.50 for starters, £14.50 for mains, and £5.20 for desserts (or £18 for two courses, £22 for three). The menu makes it clear that bread and butter are both optional and charged for, which is a nice change from the many places that leave this aspect mysterious until the larger-than-expected bill arrives. We opted to have the bread and butter, and it wasn't bad at all; the bread was a generously-filled basket of thickly-sliced crusty bread with a soft, warm interior, and the butter was decent too. Kake started with garlic and parsley mussels photo; half a dozen large mussels conveniently served already separated from the shell. Nothing wrong with these at all, and the garlic-parsley butter was quite tasty when sopped up with bread. My main was the confit duck leg with flageolet beans and a red wine sauce photo. This was again fine, though I admit to not eating most of the skin, nor the couple of fat clumps I found under it. The flageolets were cooked just right — and I know from personal experience that these are tricky beans, which can go from undercooked to mush in a very short period. Kake's verdict: Solid bistro food at reasonable enough prices, though the bill can mount up if you're tempted by the wine list. I'd certainly recommend it to anyone in the area, if only because there aren't many other options around here for more-than-casual dining (Dragon Castle and the Lobster Pot being the others). Accessibility: A step up to get in, and the toilets and bar area are up a flight of stairs. There may be other steps at various places on the ground floor, too. Last visited by itsbruce and friends, 6 Jan 2011. Last edited 2019-01-12 08:49:42 (version 5; diff). List all versions. Page last edited 2019-01-12 08:49:42 (version 5).